The price of a Wacom Cintiq 24" has dropped dramatically. Did you miss the chance to snap up a huge bargain on Black Friday? Never fear, there's still time to save on a range of top tier creative and design products thanks to Cyber Monday. We've been busy curating a list of the best Cyber Monday 2018 deals for all your artistic needs, however we thought this amazing Wacom Cintiq Pro 24" discount deserved extra special attention. Wacom leads the way when it comes to creating world-class pen displays, and with the Cintiq Pro range digital artists get to bring their work to life in a way that feels traditional and intuitive. This is because Wacom Cintiq Pro 24 offers Wacom's most powerful range of tools and capabilities, all in a 4K creative pen display. Users get to take advantage of industry-leading color accuracy (99% of Adobe RGB), plus with the LCD display artist get to examine and modify even the tiniest details of their creations. What's more, the Wacom Cintiq 24" comes with a Wacom Pen 2. This popular tool is Wacom's most accurate and sensitive pen, packed with tilt recognition and able to deliver virtually lag-free tracking. 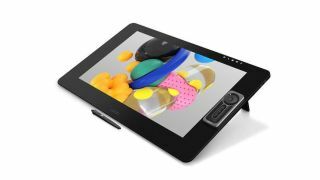 Shoppers in the US are able to save a whopping $400 on the Wacom Cintiq 24" when ordering from Newegg, with other sites offering a similar reduction, too. At this price its uncertain how long stocks will last, so if this is the product and price for you, be sure to add it to your cart.